The term “lame duck” is most often used to describe a president who is still sitting in office after his or her successor has been elected. Technically this person is still the president, but his or her decision-making power is generally perceived to be minimal. In some schools, they’ll still let you show movies. I worked in a place like that, although near the end, we were starting to get pressured to cut that out. And I understand why: As a parent, when ask my kids what they did in school on any given day, and I hear “watched a movie,” I’m annoyed. I mean, I can show my kids a movie at home. Surely school can step it up a notch? What’s worse, “show a movie” in some classes actually means “Put a movie on, but let students do whatever they want while the movie provides background noise.” And when the movie is, say, The Sound of Music, or some other classic I have waited years to experience with my kids, and then they tell me their music teacher puts it on all the time, I feel robbed as a parent. Okay, that’s my rant about showing movies in class. Take it with a grain of salt, because (a) I totally showed movies when I needed a day to grade papers and get caught up, and (b) I’m fully aware that a TON of absolutely amazing movies, video clips, and documentaries are absolutely jam-packed with educational value. So I get that it’s not the worst thing you can do, and I know it CAN be done right. This is why I would never support a school banning videos across the board; that kind of blunt policy doesn’t respect teachers’ ability to make the best instructional choices for students. HOWEVER…when it comes time to plan for Lame Duck days, we really do have so many more options beyond the showing of videos. So if you’ve decided you want to do something else, or you’ve been told you flat-out have to, here’s a great list for what to do instead. Some of these ideas come from my own teaching experience, others come from online resources, and a lot of them are from a Facebook Live broadcast I did a few weeks ago, where other teachers contributed their own ideas. I’ve broken this list into three sections, based on how much prep you’d need to do to for each one and how much time each one would take. Some list items contain Amazon Affiliate links; if you purchase from Amazon after going through these links, Cult of Pedagogy receives a small commission at no extra cost to you. These activities can be done at a moment’s notice, with little to no required materials. They can be used as a 10-minute filler or as the main activity for a whole class period. Clean-up Day: Give students a chance to clean out their binders or lockers and enlist students to help tidy the classroom as well. Learn a Line Dance: Either you teach your students, they teach each other, or you all learn together from YouTube. What’s great about line dancing is that anyone can do it, whether they have rhythm or not. Go back a few years to learn the Cupid Shuffle, further back to learn the Macarena or go way back and learn the Hustle. Thank-You Notes: Since this important life skill isn’t really a part of any curriculum, a Lame Duck day is a perfect time to have students practice it and show some gratitude to the people who deserve it. Provide them with paper and envelopes and have them write thank-you notes to friends, family members, school staff members, or other students. For best results, show them a few examples of thoughtfully written notes ahead of time. The Compliments Project: This is an incredible activity where students take turns being in the “hot seat” while their classmates write compliments on the board behind them. You have to see this one to appreciate its full impact. Watch here. Although this activity only takes about 5 to 10 minutes per student, which means it would be something you could squeeze into the end of a class period, you should only get it started if you know you’ll eventually have time to put every student in the hot seat. Go Outside: Many of the activities listed in this post could also be done outside, or you could just play a classic outdoors game like Red Rover or Red Light, Green Light. Check out this list of games for ideas. Play Charades: Teach kids the basic rules (here’s a simple overview of charades rules from the Game Gal website). Word clues could be content-related or just for fun. This word generator could provide words without the need for you to prepare anything ahead of time, and students could click through word options quickly until they find one they like. Philosophical Chairs Debate: This technique has a lot of different names, like Four Corners, Physical Barometer, and This or That, but the idea is the same: You read some sort of statement to the class, like “Students should be allowed to go barefoot in school.” Designate one side of the room as the “Agree” side and the other as the “Disagree” side. Students must physically walk to the side of the room that best represents their opinion. Then have students take turns explaining why they are standing in that spot. (If you want fantastic pre-made questions on a PowerPoint for this, take a look at my This or That icebreaker). Group Story/Progressive Writing: Have every student take out a sheet of paper and have them all write the first sentence (or two, or three) of a story. Then have them pass it to the right and pick up where the last student left off. Keep going until you have a class set of unique stories. One variation of this is to give everyone the exact same sentence to start with, and see how many directions the different stories take. These require you to do a bit of planning ahead of time, but for many, once you’ve prepared the materials, they can be used over and over again. Found Poetry: This is a method of writing poetry where you begin with a text that’s already written, like a page out of a book (photocopied in most cases). By cutting words from that text or marking out everything but a few words, students can uncover some pretty fantastic poetry. 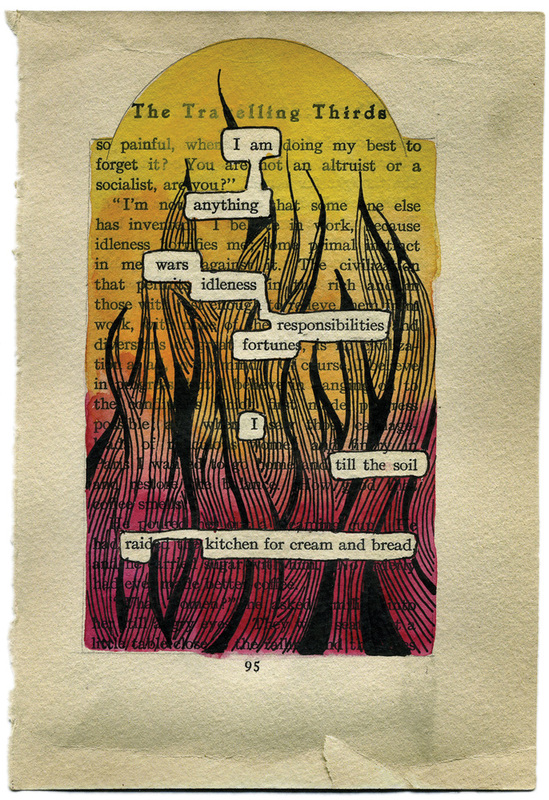 Here’s an example from the blog of poet Kate Hutchinson. Icebreakers: Get students talking with one of my three favorite classroom icebreakers. Listen to Podcasts: With some extra time, you might allow students to browse through the podcast collection at Listenwise or try out one of the 8 podcasts for students I reviewed last year. Have students use an index card to write a short review of the episode they listened to and share these cards on a board so others can take advantage of their recommendations. Skype: Once you learn about some of the free educational opportunities offered by Skype, you might not want to do anything else in your free class time. One of these is a Mystery Skype, where you connect with another class in an unknown location (only you and the other teacher will know), and students work together to ask a series of yes/no questions until they guess where the other class is. Another is a Virtual Field Trip, where your class Skypes with someone (often a professional in some part of the world, like an ocean exploration with Fabien Cousteau, the grandson of Jacques Cousteau). To learn more, visit the Skype in the Classroom page in the Microsoft Educator Community. Coloring Books: Put on some background music, open a few bags of chips, and break out the coloring books. This is an easy, relaxing activity that sets a nice atmosphere for socializing, rather than having students on their devices or zoned out in front of a screen. If you don’t want to spend money on actual coloring books, you can find plenty of free printable coloring pages online, like this set of 50 beautiful coloring printables. Read Aloud: Reading books aloud to students is not just for the young ones. Even high school seniors can enjoy sitting back and listening to you read a good book. One of my all-time favorites is The One and Only Ivan by Katherine Applegate. To find a title that has been personally vetted by thousands of students and teachers, check out the list of past books at the Global Read-Aloud. Board Games or Card Games: I think we can all agree that no one plays board games or card games as much as they used to, and the simple fun and social learning that can come from them are worth the time and effort. Some of my family’s favorites are Pictionary, Spot It!, Dominoes, Scattergories, Scrabble, Quirkle, Uno, or Yahtzee. Or just buy a few basic decks of cards, then check out the Gather Together Games YouTube channel and learn how to play something classic like Gin Rummy, Spades, or Pinochle. Mindfulness Practice: Especially during testing season, mindfulness practice can ease stress and give students a skill they can apply in so many other areas of their lives. Two great resources for starting on this journey are the Mindful Schools website, and the book Teach, Breathe, Learn by Meena Srinivasan. Two easy-to-make mindfulness tools are glitter jars and breathing sticks. Kahoot: If you still haven’t tried Kahoot, you’re in for a treat. This website lets you create interactive, game show-style quizzes that students play as a class on their own devices. You could create a content-based Kahoot, do one just for fun, or even have students create them. Genius Hour: Just in case you’ve never heard of Genius Hour, it’s a structure for giving students time to explore topics and skills they choose completely on their own. Sometimes they study a foreign language, teach themselves how to code, even start their own businesses. A Genius Hour project usually happens over a period of weeks or even months, in small increments. So if you’ve already got a Genius Hour program going, these extra bits of time are perfect for continued work on projects. To learn more about Genius Hour, check out my friend A.J. Juliani’s webinar and course here. Community Service Project: One great way to make the most of the end of the school year is to have students identify a need in the community, then plan and execute a service project. Check out these 7 ideas for service learning projects from We Are Teachers. Another type of service project could be organizing a school-wide yard sale, with the profits going to charity. Student Video Project: These can take all kinds of forms: end-of-year retrospectives, book trailers, tutorials or welcome videos for incoming students. You could even hold a student film festival where final projects are shown on the last few days of school. This classroom video guide from EdTechTeacher will help get you started. Survivor Game: Using a model like the one described here, put students into tribes and have them compete on various challenges in the style of the TV show Survivor. These can be just regular challenges or they can be developed using course content. Amazing Race Game: Just like with the Survivor game above, you could coordinate a game based on the show The Amazing Race following a plan like this one. Literature Circles: Amid all these other creative ideas, the humble literature circle may not seem quite so exciting, but never underestimate the value of a small group of students talking about a fantastic book they’re all reading. To learn more, see this Getting Started Guide to Literature Circles from ReadWriteThink. BreakoutEDU Activities: BreakoutEDU is kind of hard to explain, but I’ll give it a shot: It’s a kit that contains several boxes, a few locks, an invisible ink pen and UV light, a USB drive, and a few other pieces of equipment. The deal with the box is that teachers use them to facilitate games, games that feel like a cross between a mystery and a challenge, where clues are left around the room and students have to answer questions in order to find them. In the same way that you can plug questions or content into a platform like Kahoot, you can do the same with BreakoutEDU (they also have a lot of pre-made games available for purchase). Learn more here. Student/Teacher Unconference: Using a chunk of hours or a whole day, teachers and students plan short lessons on things they are interested in outside of school (crafts, yoga, cooking, martial arts, music, dance, technology), then sign up for time slots like an EdCamp. With the schedule in place, students and teachers can then sign up to attend the ones they are interested in. This would definitely take some planning, especially the first time, but it could be so worth it. What is an unconference? TED Talks: Watching these short, powerful presentations has become almost a rite of passage for 21st century humans. Have students watch a few to understand the style, then plan and deliver their own. When it comes to teaching seniors during last semeser, I am all about the projects! I had students do an I-Search paper for years, and that was great. When I do show films, I want to push them a little and get them to watch a great movie that they wouldn’t watch on their own. Some of my favorites are Rabbit Proof Fence, Cool Hand Luke, and Rear Window. Great ideas! Thank you. As a graduate of the Mindful Schools Year Long program, I teach mindfulness in the classroom and can say it’s a powerful way to teach students skills that they can use in and outside the classroom. Wish I had this last week for four days of after standardized testing lame duck classes. I will be filing it away for next year. Thanks! I sometimes have an “Iron Physicist Contest”on the day before break. I teach physics, but this idea could be used for any science or elementary classroom as an “Iron Scientist” contest. I put out a set of misc. equipment and a secret ingredient. Students are asked to create a demonstration that illustrates a physics concept we have learned during the year. Typically I put out string, tape, small weights, rubber bands, blocks of wood, spring scales to measure force, and dowels. Students get very creative and at the end of class they show each other their demos, including a physics explanation. This is such a cool idea, Sally. Thanks for sharing it! I’m a little confused about the video rant when one of the suggestions is literally eat and color. Yeah. I guess I would rather have kids socializing over coloring books than staring at a screen. I completely understand coloring and socializing instead of a movie. My school doesn’t have art, so coloring and drawing is a HUGE treat for my students and lets them get their creativity flowing. Sometimes, I’ll let them color or draw a picture, then trade it with someone else who write a short story about it. I love showing certain movies, again ones they may have not seen. My own kids hated that go from class to class watching one movie after another- usually a Disney or other movie everyone has seen a million times. Personally, Im glad that schools have clamped down on this- and make sure they are tied to an academic state standard. Totally get the rant- and nothing wrong with coloring- its the new calming thing for adults- why not kids? Thank you for compiling this innovative list of things to do when… My school is one that has been told not to show movies (even though I know some people still do. Lol!). I have tried a few low prep ideas on the list, and the students are almost always content to take a mental break. Again, thank you for sharing these list. I am sure I will be back to use some of these ideas! Thanks for the ideas! Two of my favorite “lines” I’ve participated in with adults: line up in order of how hot you like your salsa, from fire-hot to “just give me ketchup.” Another: line up in order geographically, based on where you graduated from high school (from nearest to current location to farthest away). Also, this is my fravorite game to play with kids and adults. It is called Find the Fiction or Two Truths and a Lie. You say or write three statements about yourself. Two are true and one is a lie. The rest of the group has to guess which statement is a lie. The game naturally encourages the player to think of some unusual things to share about themselves that the group does not already know. But it’s still a safe environment because you can decide what you want to share. It always sparks interesting conversations, for both kids and adults. Last: my favorite board game for second through fifth grade is Apples to Apples Jr. It’s an easy way to encourage oral language skills, and you can boost higher level thinking by asking the judge to explain why she or he chose one answer over the others. Thanks for sharing these, Elaine. LOVE the salsa one!!! We have IB exams at my school in May where only some groups end up having lame duck periods. I bought games you might be interested in: Codenames -develops conceptual thinking, cooperation and is dangerously addictive (grade 5 and up) the other one is coming out in May -but I have tried it in French- is called Unlock and is an escape room type of game, so team problem solving, cooperation, listening and thinking skills, great fun (grade 7 and up). Not so lame after all! 2 games on the tablet if you have 1:1 -Device 6 for ages maybe 15 and up (reading, problem solving skills really weird setting, my students were hooked. And 80 Days (more like grade 6-9) reading and decision making+geography. Maybe we could make a FB live one day about great games for schools or even at home for learning. Fantastic ideas! Thanks for posting the “Amazing Race” lesson link. So doing this in June! This is an amazing post! We could take a week to study and discuss all the wonderful ideas and resources here! Thank you. Also look into free online learning resources focused on life skills. This is the best time of year, once the pressure of testing is off, to teach my students the things I wish they were talking about at home or over the summer. Great addition for the mindfulness activities. Look into EverFi’s Healthy Relationships program, too. I’m also big into financial education which is how I found them. http://www.everfi.com/k-12 will tell you more and you can sign up there. Kat, I’m a Customer Experience Manager with Cult of Pedagogy. Thanks so much for sharing — we’ll check it out! I couldn’t even get past your rant in the beginning to listen to the rest of the podcast. Telling schools to “step it up” if your kid watches a movie? Wow. Well, then you missed the part where I admitted to showing movies myself and how I totally understand why a teacher would do it. Sorry. Excellent list! Thank you so much for sharing. It generates a question, and students must search Google to find the answer. Some of the questions are not that easy to solve and require moderate to advance search techniques. It’s a fun way to help students practice using the internet to find what they’re looking for. Thanks again for all the tips! Much appreciated! Another idea to consider… a Cardboard Creation station where kids will create just about anything, given the chance. Scissors, duct tape, and cardboard (cereal boxes, parcel post boxes…anything) are all you really need. If you listen in closely while kids are at work, you’ll hear lots of math talk, science/engineering talk, social talk, collaborative problem solving, and plenty of “ah-ha!” moments. I stumbled across this podcast at just the right time. I have five lame duck days coming up next week for testing. I’m not gonna lie, the first afternoon after testing will be a movie day. I doubt anyone has been waiting for just the right time to share Planet Earth: Caves with their child so it’s likely that no parents will be robbed of an experience in my showing of the movie. There are some great ideas here. Many of which I am already familar but I have never thought about using them on days like these. Thanks for sharing. I do have to admit when I heard you plug your Teachers Pay Teachers site my heart sank. While I understand the concept of the site is so that teachers pay each other for their hard work rather than publishers or curriculum developers, I could never in good conscience us charge another teacher money to use something I’ve created . My team of #sciencehippies and I share our lesson wealth freely with all those who ask. This is Debbie, a Customer Experience Manager with CoP. Thanks for sharing! The conversation about whether teachers should pay other teachers for what they create is one that does seem to creep up every now and then. Angela Watson has a really great post called Why teacher-authors don’t give everything away free (& neither should you). It offers an insightful perspective that’s worthy of considering. These are amazing ideas to get us through those days that the rest of the building is testing and the lower primary students are somewhat stranded in their rooms. I would, however, like to offer a word of caution on red rover. While I’m not exactly a bubble-wrap parent, I’ve seen more than one arm get broken while playing this classic. Once under my watch and again on another rookie’s. I surely don’t mean to be critical – your compilation will be printed and shared with my second grade team because it is a wealth of fabulous ideas. Just opened this after hearing that my library time has been cancelled and I have NO plans ready to go. Thank you, thank you, thank you! We are writing thank you notes to the Watch Dog Dad who came to our class yesterday. Thank you, Jennifer! I love all your podcasts. I just wanted to let you know that I think the online page for the “list of games” played on the T.V. show Whose Line Is It Anyway? got deleted. Thanks for letting me know, Celine! Minute Earth, Minute Physics, Smarter Every Day, and connection circles are good too. For math teachers, a Desmos activity is a great way to get kids engaged. They have loads of marbleslides and other activities. KenKen puzzles are also a fun way to challenge kids. Math has the easiest time finding things for Lame Duck days, I think, because there are so many math games out there that are challenging but fun. One of my favorite games to play with kids is Geoguessr, which is a website that shows you a random location from Google Earth. You then have to toggle around the area and use context clues to guess where in the world you are. Honestly I feel a little guilty because I enjoy playing it so much myself, but my students also get really into it, and I think it helps expose them to what the rest of the world really looks like outside of famous sites. It’s also great because everyone is competing together against the computer instead of against one another. I just got a link from Scholastic for a site called Checkology by the News Literacy Project. It provides a full digital curriculum on telling real news from fake news. It looks like it might be good for the end of the year! Moira, I was just reading this and thinking “how can I tweak this for Kinders? ?” My all-time favorite is playing BINGO and giving away the things I felt too guilty to put in the trash (keeps me from hoarding! sorry parents!) like a ziplock of used sidewalk chalk or old posters that no one took from the giveaway pile in the hall. The kids bring a beach towel and we play several times throughout the day. In keeping with the beach-ish theme, I like the idea of learning a hula dance and then performing for another class. I think we’ll make thank you posters for the custodians, cafeteria staff, nurse, and office assistants. In lieu of coloring books, I have a white button down shirt the kids will get to draw a self-portrait on and I will wear it to see them off (thanks Goodwill!). Throughout the last week I read all the books we read at the beginning of the year (Interrupting Chicken, Hurty Feelings, A Porcupine Named Fluffy, etc.) and then I end our time together with “You Are My Wonders” by Maryann Cusimano Love and Satomi Ichikawa (and I cry Every. Single. Time.) Have a great and well-earned break!